About twice a year-- in late spring and again in early winter-- a steady stream of resumes come in over the transom from college seniors and MBAs. We haven't (publicly) posted a job in several years, so I can only assume these eager beavers are attracted to the perceived glamour of consulting mixed with the excitement of the startup world, and this has somehow triangulated them to our doorstep. For the benefit of aspiring and future startup consultants everywhere (and perhaps to scare off a few wannabees), I thought I’d write a few notes on the "reality of life as a startup consultant". Here goes. Working with entrepreneurs who are out to change the world is awesome. I'm lucky to spend my days and nights with movers, shakers, dreamers and visionaries…as Steve Jobs put it, the "Crazy Ones." I compare this with my first few jobs in valuation and investment banking, which were remunerative but stifling and draining; I truly hated to go to work each morning. In contrast, the passion and energy founders bring is contagious, and fires me up every day. At any given time, I'm typically working with 3 to 6 different startups simultaneously, which means I slice my time up into increments devoted to each startup. Jumping from a crowd funding startup in the morning to a hardware company at lunch to a B2B SaaS business in the afternoon lets me exercise multiple mental muscles…think Crossfit for the brain. Startups are by definition doing something new; thus, many of the challenges I deal with on a day-to-day basis are also new-- whether it's structuring a new business model, analyzing a new market, or exploring a new marketing approach. Solving startup challenges is often chaotic, messy, and ambiguous; but pushing the envelope, facing new challenges and blazing new business trails is a thrill, and keeps the job fresh. Related to the above, working with startups means you're always on the front lines of new trends in technology-- sometimes way out in front of them. I worked with Kickstarter back before there was an "e" in the name, and before anyone had coined the term "crowdfunding." I spent a lot of time with Autonet, a pioneer in connecting the car to the Internet, and with Appbackr, a pioneer in mobile app distribution. The point is-- staying on the cusp of new tech trends takes a lot of energy, but it's fun to see new industries sprout and blossom, and to know you had a (small) role in making it happen. The flip side of working with dreamers, visionaries, and the "Crazy Ones" is that you're working with dreamers, visionaries, and, literally, the "Crazy Ones." It's an understatement when I say there are a lot of wacky people who are starting companies (the old joke is that you call yourself an "entrepreneur" when you can't get anyone to hire you and give you a proper job title :). Startup culture tends to be a magnet for the best and brightest, but it also lures all the misfits and kooks (I’ve even considered writing a book collecting the nuttiest inquiry emails I’ve received; there are some insane ones). Overall it's not that big a deal-- generally it means you have to fine-tune your filters-- but it's still time-consuming and taxing to weed out the big dreamers from their nearly identical nut job twins. This has been a difficult one for me to deal with-- it took a long time to build up some scar tissue here. In short, despite having the right ingredients (good idea, strong team, capital, etc.) and despite putting in the hard work, the vast majority of startups will still fail, for any variety of reasons (market shifts, funding environment changes, CAC is too high, etc.). Even though the high startup failure rate is a known fact, it still materially stings when I've worked for 6 or 9 or 19 months with a team, put in the sweat, blood and tears, been there in the trenches and along for the emotional roller coaster rides, and the company doesn't make it. I’m not sure it ever gets easier. Startups are cheap as f*ck. From a career perspective, this is perhaps the biggest challenge, and why the ranks of professional startup consultants are relatively thin. Startups either a) have no money to pay you with, or b) have been trained to think that they should always get everything for free (a practice probably fostered by large law firms that defer fees for some period of time). I totally get it-- I'm a huge fan of bootstrapping and doing it lean-- but I've noticed a growing sense of "entitlement" among founders who feel that solely by virtue of being a young company, they automatically deserve a free ride. Bottom line, getting paid is a challenge. The only solutions I've found are to target startups that have raised some seed money, or to target founders that were perhaps employee number 5 at their last startup and are now CEO. These founders have an exit under the belt (= $) and have "done it before", and thus know how valuable it can be to get outside professional help. You should only become a startup consultant if you, like most entrepreneurs, are a little bit crazy and have so much entrepreneurial DNA you can't handle a "normal" job. After leaving the i-banking world, I founded one small startup that did ok (small exit) and tried to start another during b-school. It failed the week of graduation and as such, I had missed all on campus recruiting. Having zero job offers (or even prospects) was oddly liberating, and I took to heart some advice from a professor-- "find out what you love to do, and do it well enough that people will pay you for it." I loved startups, I loved consulting, I didn't have any new ideas for starting a startup, so I put these pieces together and hung out the shingle for VentureArchetypes. Bottom line, it's a hard business and you're not likely to make a lot of money at it (during my first year in business, we generated only $32k in revenue!). You must simply love, live, eat and breathe startups if you want to make this job a career. To put it bluntly, if you want to optimize your life for money, you should pursue a path in traditional consulting (BCG, McKinsey) or in investment banking. If you want to work with startups, the money has to be secondary. This business model usually involves finding one or two main service lines that can be streamlined and performed repeatedly and very efficiently. For example, in the early days I did a ton of business plans and financial models for startups-- that was the main revenue engine (and to note, I still do a lot of models and decks, as I really enjoy the work). A few firms in the industry have done a good job of streamlining or mass-assembly-lining this business; for example, MasterPlans and Caycon have built large (and presumably profitable) businesses by cranking out hundreds or thousands of business plans a year. An alternate (and polar opposite) approach is to take on fewer startup clients, but get deeply in bed with them and bet on the potential long-term upside of the company. An example would be a consultant who spends 1/3rd of her time with a startup acting as interim CFO or marketing person, and who takes a few points of equity in the company. This might also be structured as a small monthly retainer with a significant bonus paid when the startup closes a proper funding round or is acquired. The advantage of this structure is the shared risk and upside. The disadvantage is the point I made above-- most startups fail. The remedy would seem obvious-- pick really great startups-- but ask your favorite VC, who's highly paid to pick startup winners, if that’s not easier said than done (most VC firms make all their upside on 2 out of every 10 deals; the other 8 either fail or flat line). Fortuitously, I’ve had a couple clients hit it out of the park and pay off, but I also own a ton of worthless startup stock (and even worse, on more than one occasion I’ve put in 6-18 months of hard, roll-up-the-sleeves work with startups that ended up running out of money). A final way I've seen startup consultants do well is by productizing their work into something scalable beyond an hourly fee or retainer. This might take the form of books, workshops, Udemy lessons, software tools (like I’ve done with Foundersuite), an event series (as I’ve done with StartupExits and StartupBD) or even by creating a co-working space or incubator (Founder's Institute comes to mind). All good stuff, but selling products or becoming a successful author is harder than it looks; the ones who do it well (think Malcolm Gladwell or Eric Ries) do quite well financial. Back to the resumes from the college seniors and MBA students. How do you crack into the startup consulting world? The two most common ways of wedging your foot into the door are either by packaging your skills into a discrete offering (the specialist approach), or by gaining and packaging a broad base of experience (the generalist approach). For the specialist approach, I suggest finding a tangible, clear, and marketable "thing" you can package and sell-- 409A valuations, MVP mockups, setting up analytics and user metrics, A/B testing services, etc. In the early days, my “thing” was building financial models; I knew how to build a killer model from my days in investment banking, and I tailored the service for startups (and still build a ton of them today). The experience gained from helping startups in this way enabled me to expand into a variety of other areas, such as capital raise strategy, exit consulting and startup BD. The alternate approach— selling your experience-- is a somewhat harder and longer road to plow. To be able to make a living as a “generalist” startup consultant usually means you've done something unique and rare enough that others will pay you for your general insight. Typically, this means you started a company, achieved some sort of remarkable result or exit, and are now in a position to coach others. An example that comes to mind is my buddy Gagan Biyani who founded Udemy, ramped it quickly, then left and consulted to firms like Lyft. I have yet to see many (or any) recent college or MBA grads make it as a generalist consultant; there just isn’t enough perceived value or demand or to create a real market for a generalist startup consultant who doesn’t have a significant exit or other notable achievement under his / her belt. I hope this has been helpful to would-be startup consultants. I'd love to hear your story-- what you're doing to get into the market, what service or niche you've focused on, how you discovered or built your business model, and what are the results? Email me when you get a moment. Thanks! Wonderfully written. 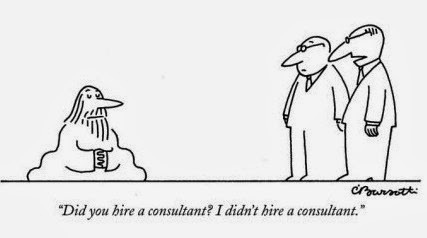 Heading the consultant way myself I can relate to it completely. Not to forget the founders who have a set outcome in mind and cannot accept the industry knowledge that you bring in and fail to understand why they are not getting any traction. Just stumbled across this great post, Nathan. I can relate to much of what you wrote: Practicing business law for seed- and pre-seed stage startups could be viewed as a sub-specialty within startup consulting. I like to joke that the dumbest business model for a professional services firm is to spread one's time and effort among a large number of small clients with limited cash, sporadic workflow, extra cost sensitivity, and a propensity to go out of business. That said, the rewards of working with startups and entrepreneurs are as unique as founders themselves.